The Federation is sending a bunch of heavy-duty replicators to Cardassia to help rebuild the battered empire following the Klingon invasion. Eddington is leading the efforts and he and Odo tell Sisko that they suspect that his new main squeeze, Kasidy Yates (Penny Johnson) is smuggling goods to the Maquis on her freighter — something they confirm by following her ship to the Badlands in a cloaked Defiant. They plan to arrest her and the Maquis on their next trip — a big part of the episode is Sisko not wanting to arrest her — but the Defiant lies in wait as Kasidy’s ship waits for hours for a rendezvous. It turns out the whole thing with Kasidy was a ploy by the Maquis, specifically Eddington, who has defected(! ),to get Sisko and most of the senior staff off the station to steal the replicators. Sisko leaves Kasidy’s ship behind to try to catch Eddington, but he’s too late. 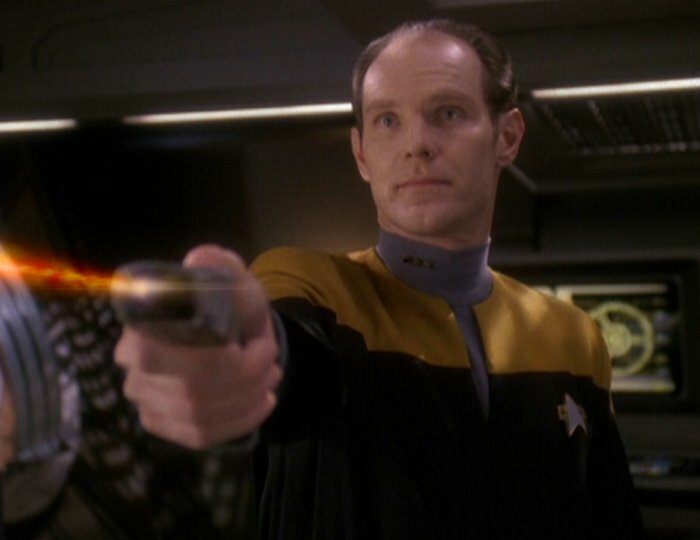 Eddington contacts Sisko and gives him a blistering speech about his reasoning, and Sisko vows to hunt down Eddington, even if it takes the rest of his career. 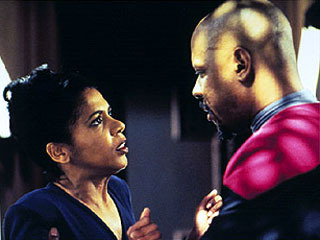 Kasidy returns to the station to face the music and tells Sisko she’ll return to him after some time in prison. This is another example of the creators showing Cardassia in really bad shape following the Klingon invasion. That’s important considering where the Cardies turn for help in season five. It also shows the expanding grasp of the Maquis, who had largely been forgotten about in season four (probably because the Klingons were taking so much focus). Eddington’s defection isn’t a galaxy-shaking domino, though we learn later that the Maquis scored their biggest victories under his leadership (at least, that’s what he says). In a bigger picture way, this is a good example of why DS9 was a compelling show. On TNG or Voyager, it’s very likely we never would have heard of Eddington again. But we see two more episodes involving him, one of which is a personal favorite of mine — and both are pretty significant moments in the DS9 tapestry. I’ve always wondered where the hell Dax was at the end of this episode. It’s true that Sisko, O’Brien, Worf and Odo are on the Defiant while Eddington does his thing — and, of course, he stuns Kira. But Dax was fourth in command and must have been in the holosuite or eating steamed azna while Eddington stole the replicators. Speaking of Eddington’s plan, it all comes together a little too well, doesn’t it? That he was able to so cunningly get Sisko, Odo, Worf and O’Brien off the station — and stun Kira — was pretty incredible. And, really, it’s disappointing to think that the junior officers would be dumb enough (and that Eddington would know they would be dumb enough) to go along with everything he did. Beyond that, how did Sisko — yet again — justify using the Defiant’s cloaking device in the Alpha Quadrant? This was expressly forbidden from what we learned in “The Search”, but Sisko pretty much ignores that rule whenever he thinks it’s appropriate. Hmmm. While Kasidy Yates vacillates between being an important character (like in this episode) to being not important (like when she only appears once in the sixth season) to being important again (like when she shows up for most of the last leg of the final season). We haven’t had a real chance to dive into the character, though she did show up in “The Way of the Warrior”. Oh, and I suppose you COULD argue that Garak’s new relationship with Ziyal — a rather weak subplot — is somewhat significant given later events. Still, Ziyal’s later importance has more to do with her father Gul Dukat than with Garak. Also, it’s odd that another actor plays Ziyal here, and that another one will play her when we see her again. This was DS9’s weirdest casting issue, BTW. Hilariously, Eddington (Starfleet head of security on DS9) is nowhere to be seen when the Klingons attack. Hell, he’s not even mentioned! The creators should have used this as an opportunity to explain where Eddington was at that point. With just a few lines of dialog, they could have established that he was on a mission and witnessed the Maquis hit in the crossfire during the Klingon invasion of Cardassia. Remember, Sisko did everything he could to save the heads of the Cardassian government, but didn’t (apparently) let the Maquis know the Klingons were coming. That could have easily enraged Eddington into defecting. Here come the judge, here come the judge for Odo.